BustedSpoke.com - Search New England source for mountain bike trails, bike pictures, trail maps and more. *** Update. DH race has been replaced by an enduro stage challenge with ample downhill. AM bike will work well. The Snow Bowl is spinning the lifts again on Aug 14th from 10am-3pm. Lift passes are $15. Come ride and experience some classic New England all mountain trails where the "Mountains meet the Sea". 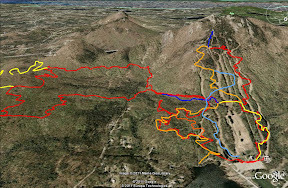 Trails can take you down the mountain in 3 minutes or 3+ hours via XC/AM trails. First lift day of the season is next Sunday, June 12th, 10-3pm $15. Let's get some momentum going for another lift accessed riding location.